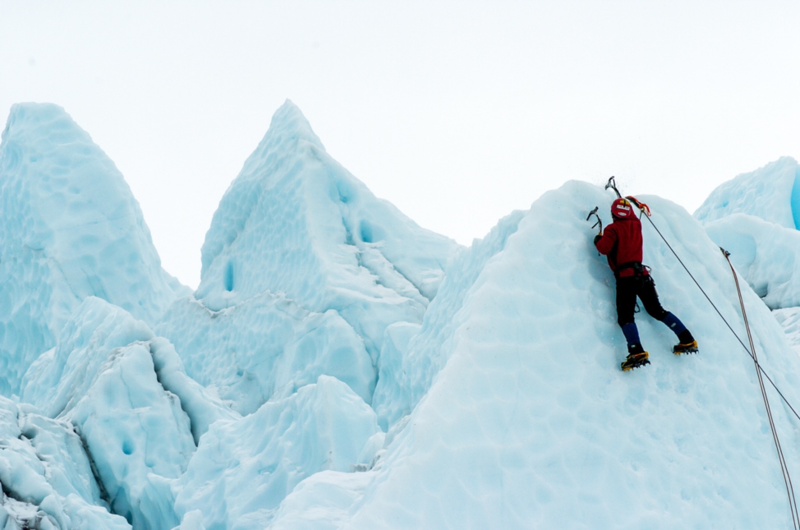 When the temperatures begin to drop, layering up properly becomes more important than ever, especially for anyone pursuing wintertime outdoor activities such as ice climbing. Too many layers can be cumbersome and cause overheating while too few layers can lead to a chilly and potentially miserable day out. If you have plans to head out into the cold for some alpine climbing this winter, use this guide to help you layer up properly. Your most important layers are your base layers. As they sit directly next to your skin, these can make or break a good layering set up. When picking out a base layer, fabric choice is crucial. Stay away from anything cotton, as cotton does not offer many performance properties. As you sweat, cotton tends to hold moisture, causing you to get the chills quickly. Instead, opt for merino wool thermal underwear or something made from a synthetic material or merino wool. Both of these materials help to pull moisture away from your body, quickly evaporating sweat into thin air. This will keep you warm and dry all day long. Many of these materials even offer anti-microbial properties to help keep the stink down! The next step in creating the perfect layering set up for alpine or ice climbing in intense winter conditions is picking out the right mid layer. Picking out the right mid layer can take some time, as there are a number of options that can work depending on the conditions and your personal preference. If it is shaping up to be a fairly warm winter day, a light or mid weight fleece may be the ticket. As a material, fleece offers plenty of advantages. The fabric is warm and cozy, meaning it will never irritate your skin, even after a long day on a multi pitch climb. Fleece is hydrophobic, meaning that if it gets wet, whether from snow, sleet or even just sweat, it will absorb very little, if any of the moisture content. The downside to fleece is that because it is hydrophobic, it won’t absorb soaps or detergents, making them difficult to clean. Fleeces tend to hold on to odors and get funky over time. Should you choose to brave the coldest of winter temperatures in the pursuit of a climb, opting for a heavier, more technical base layer such as a down jacket can help keep you warm and toasty throughout your endeavor. Like fleece, down has plenty of advantages and disadvantages. Down is very insulating while remaining lightweight. Many down jackets on the market these days come with an integrated stuff sack, making them incredibly easy to stow in a pocket or clip to your harness mid climb. However, down does not breathe very well and can cause you to overheat during periods of high exertion. Another downside is that most down products become nearly worthless once they get wet. Choosing the perfect mid layer can be a tedious process as there are many options to choose from, depending on the conditions. Most serious outdoor athletes eventually end up with closet full of mid layers, ensuring that they have something that is perfect for any condition that Mother Nature should throw at them. When it comes to choosing an ideal outer layer for alpine climbing in cold and snowy weather, you must first choose between a hardshell or soft shell jacket. For long days involving heavy exertion or days where precipitation won’t be much of a factor, a soft shell can be the ticket. A soft shell jacket can come in many different forms, but they tend to be warmer, heavier, and more comfortable than a hardshell. They are very durable and can also make for a great mid layer on the coldest days. Some may feature a hood, but that isn’t always the case. The main downside to a soft-shell jacket is that most tend to be water-resistant at best. Some are waterproof but may not provide the best protection on a very wet day. Hard shells on the other hand, are known to excel in wet and windy conditions. Hard shells are made of a waterproof, breathable outer shell, that sheds water and blocks wind even in the most intense conditions. When looking for a hard shell for alpine or ice climbing, make sure to choose one with a hood that is able to fit over a helmet. This is a key feature to look for in the perfect outer layer. The main downside to a hard shell jacket is that it does not provide any insulation on its own. When opting for a hardshell, your mid and base layers make all the difference in ensuring comfort all day long. To ensure a safe and fun day of climbing, it is important to keep your head, hands and feet warm. Once those start to get cold, it can be difficult to recover. Though your climbing helmet will help to keep your head warm, skull caps can be a good option to layer underneath. For the coldest days, a balaclava can help insulate both your head and your face. Keeping your hands warm and functional without sacrificing too much dexterity can be tricky but is an essential part of layering up for winter time climbing. Without the use of your hands, things can get sketchy very quickly. Opting for a pair of warm, but lightweight gloves that offer good grip can be great while on the ropes but won’t offer as much warmth during down time spent belaying or rigging. If your hands are easily chilled, a second pair of heavier weight gloves or mittens can be a nice addition to your winter layering kit. Finally, don’t forget about your feet! Once your toes get cold, they can be very difficult to warm back up without some serious effort. A good pair of warm wool socks designed with performance in mind are a must for any sort of winter expedition. Ian Campbell Ian Campbell is the founder of Love the Backcountry, a freelance writer and a long time lover of adventure travel based in San Diego, CA. When not writing about the backcountry, he can typically be found hiking, backpacking and camping in the mountains around San Diego and looking to lay his head beneath as many trees as he can find.